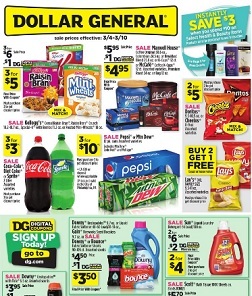 Find Weekly Specials from Dollar General, valid April 21 – April 27, 2019: 3/$5 Kellogg’s Cereal Raisin Bran, Raisin Bran Crunch 18.2-18.7 oz., Special-K with Berries 11.2 oz. or Frosted Mini-Wheats 18 oz. ; $4.95 Maxwell House Coffee Original 30.6 oz., Colombian 24.5 oz. or Breakfast Blend 25.6 oz. or K-Cups 12 ct. or McCafé Coffee K-Cups 12 ct., Premium Roast 24 oz. or Bag 12 oz. ; 3/$3 Coca-Cola, Diet Coke or Sprite; 2/$5 Doritos 9.5-10.5 oz. or Cheetos 8-9 oz; $3.50 Downy Unstopables 9.7 oz. or Liquid Fabric Softener 48-60 Load/41-51 oz., Gain Fireworks Scent Boosters 9.7 oz. or Downy or Bounce Fabric Softener Sheets 90-105 ct.; $.70 Cesar Dog Food; $8 DG home Ultra Strong Bath Tissue; $12.95 Heartland Farms Dog Food Grilled Favorites 31 lb. or Savory Gravy 30 lb. ; $3 Farm Rich Mozzarella Sticks; $2.75 Kraft American Singles or Velveeta Slices; 4/$3 Hunt’s Snack Pack; and more.